Bidder memorials in Stoke Fleming churchyard. 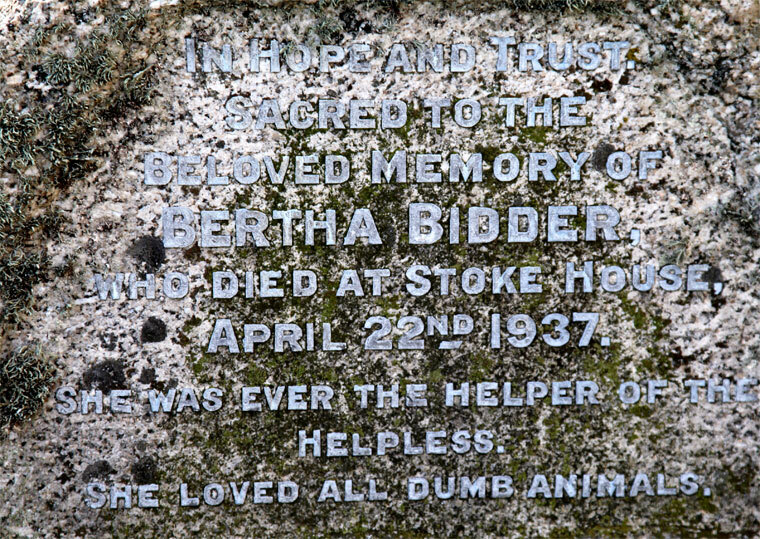 Bertha Bidder. Bidder memorials in Stoke Fleming churchyard. George Parker Bidder (1806-1878) was an English engineer and calculating prodigy. 1806 June 14th. Born in Moretonhampstead. He displayed a natural skill at calculation from an early age. His father, who was a stonemason, went on to exhibit him as a "calculating boy." In this way his talent was turned to profitable account, but his general education was in danger of being completely neglected. Still many of those who saw him developed an interest in his education, a notable example being Sir John Herschel. His interest led him to arrange it so George could be sent to school in Camberwell. There he did not remain long, being removed by his father, who wished to exhibit him again, but he was saved from this misfortune and enabled to attend classes at the University of Edinburgh, largely through the kindness of Sir Henry Jardine, to whom he subsequently showed his gratitude by founding a "Jardine Bursary" at the university. On leaving college in 1824 he received a post in the ordnance survey, but gradually drifted into engineering work. 1825 George Bidder, Civilian in the general Trigonometrical Survey, became a member of the Institution of Civil Engineers. In 1834 Robert Stephenson, whose acquaintance he had made in Edinburgh, offered him an appointment on the London and Birmingham Railway, and in the succeeding year or two he began to assist George Stephenson in his parliamentary work, which at that time included schemes for railways between London and Brighton and between Manchester and Rugby via the Potteries. In this way he was introduced to engineering and parliamentary practice at a period of great activity which saw the establishment of the main features and principles that have since governed English railway construction. He has been praised as the best witness that ever entered a committee-room. He was quick to discover and take advantage of the weak points in an opponent's case, and his powers of mental calculation frequently stood him in good stead, as when, for example, an apparently casual glance at the plans of a railway enabled him to point out errors in the engineering data that were sufficient to secure rejection of the scheme to which he was opposed. In consequence there was scarcely an engineering proposal of any importance brought before parliament in connexion with which his services were not secured by one party or the other. On the constructive side of his profession he was also busily occupied. In 1837 he was engaged with R. Stephenson in building the Blackwall railway, and it was he who designed the peculiar method of disconnecting a carriage at each station while the rest of the train went on without stopping, which was employed in the early days of that line when it was worked by means of a cable. Another series of railways with which he had much to do were those in the eastern counties which afterwards became the Great Eastern system. He also advised on the construction of the Belgian railways; with R. Stephenson he made the first railway in Norway, from Christiania to Eidsvold; he was engineer-in-chief of the Danish railways, and he was largely concerned with railways in India, where he strongly and successfully opposed break of gauge on through routes. Though he sometimes spoke of himself as a mere "railway-engineer," he was in reality very much more; there was indeed no branch of engineering in which he did not take an interest, as was shown by the assiduity with which for half a century he attended the weekly meetings of the Institution of Civil Engineers, of which he was elected president in 1860. He was "one of the first to recognize the value of the electric telegraph. That invention was in its infancy when, in 1837, jointly with R. Stephenson, he recommended its introduction on a portion of the London & Birmingham and on the Blackwall lines, while three years later he advised that it should be adopted to facilitate the working of the single line between Norwich and Yarmouth. He was also one of the founders of the Electric Telegraph Co, which enabled the public generally to enjoy the benefits of telegraphic communication. In hydraulic engineering, he was the designer of the Victoria Docks (London)(Image (1)), being responsible not only for their construction, but also for what was regarded by some people at the time as the foolish idea of utilizing the Essex marshes for dock accommodation on a large scale. His advice was frequently sought by the government on points both of naval and military engineering. 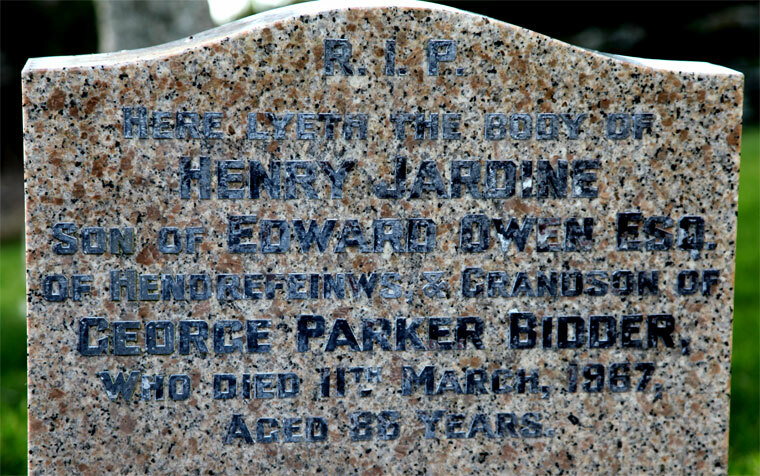 George Parker Bidder was born on the 14th of June, 1806, at Moreton Hampstead, a village on the borders of Dartmoor, where his father was a stonemason, and where his ancestors had lived for many generations. He was one of the last survivors of the great company of civil engineers to whose skill and indomitable perseverance, both in meeting natural difficulties and in overcoming the opposition caused by ignorance and prejudice, the present railway system is owing. But independently of this, his career was for other reasons eventful and interesting. His extraordinary, and almost unparalleled, arithmetical powers brought him into public notice at an extremely early age. In such cases mature years have but too often failed to redeem the promise of juvenile precocity. It was not so, however, with Mr. Bidder. His remarkable faculty never deserted him, and was the fulcrum by which he was enabled to rise from a very humble station to the position of professional eminence he afterwards attained. When about six years of age George Bidder was sent to the village school, but he played truant on every possible occasion. At this time he did not know the common numerical symbols, nor the meaning of the word multiplication; but, having been instructed to count up to a hundred, and possessing sundry treasures in the shape of marbles, shot, etc; he was accustomed to amuse himself by arranging these objects in squares and rows of different numbers. Then, by counting them over, he ascertained, and fixed in a singularly retentive memory, the results of the combinations. In this way he taught himself the value and relation of numbers, and acquired a marvellous facility in dealing with them. The incident which first brought his talents into notice was a dispute between two neighbours about the weight and price of a pig which one was selling. George Bidder, then about seven years old, who was playing near, suddenly ceased his game, and going up to them, said, "You are both wrong," naming at the same time the correct price, to the great surprise of the disputants. The village blacksmith's forge - a favourite resort of his, and frequented by all the gossips of the neighbourhood, - became the scene of numerous displays of his power; and many a stiff question was there propounded, and answered by little George, as he sat perched beside the forge fire. Meanwhile he received no instruction in arithmetic beyond the desultory scraps of information derived from persons who came to test his powers, and who often, in doing so, gave him new ideas, and encouraged the further development of his peculiar faculty, until he obtained a mastery of figures that appeared almost incredible. He is described as having been at this time a bright merry little fellow, full of fun and mischief, rather shy when called upon to exhibit his talents before strangers, but slyly enjoying the surprise elicited by his almost instantaneous replies. His reputation soon increased so much that he was taken by his father to all parts of the country to exhibit his extraordinary gift. In April 1815, he was presented to Her Majesty Queen Charlotte by the Bishop of Salisbury, and on that occasion solved various intricate questions with great rapidity and precision. This travelling about the country, for the purpose of exhibiting his son’s powers proved so agreeable and profitable to his father, that the boys education was entirely neglected. Fortunately, however, amongst those who witnessed his public performances were some gentlemen who thought they discerned qualities worthy of a better career than that of a mere arithmetical prodigy. The Rev. Thomas Jephson, Fellow and Tutor of St. John’s College, Cambridge, and the late Sir John Herschel (then Mr. Herschel) visited Moreton in the autumn of 1817, to see the 'Calculating Boy' and they were so much impressed by his talent and general intelligence that before the vacation was over Mr. Jephson and his Cambridge friends agreed to defray the expenses of his education. His mother was delighted with such a prospect for her boy: she was a good woman, possessed of a great deal of character, and capable of looking beyond the temporary interruption of gain for her son’s ultimate advantage. All who knew her, spoke of her as a very pleasing person, and her son George held her memory in most affectionate reverence. The father’s consent having been, with much difficulty, obtained, he was placed with the Rev. W. Jephson, master of the Grammar School at Camberwell. There he remained for about a twelve month, when his father insisted on removing him, for the purpose of resuming the exhibition of his talents. The boy was accordingly taken from Camberwell, and set forth again, with a sad heart, on further journeys. Once more, however, kind friends interfered in his behalf, and this time with better success. Among other places, he was taken to Edinburgh, where he attracted the notice of Sir Henry Jardine, a generous and liberal-minded man, who long held the office of King’s Remembrancer for Scotland, and who may be regarded as the founder of George Bidder’s fortunes. Sir Henry was so pleased with the boy’s disposition, and so satisfied with his capabilities, that, with the assistance of Sir William Rae, Sir George McKenzie, and some other friends, he raised a sufficient subscription, and became responsible for his education. George Bidder was then placed with the Rev. A. Stewart, a private tutor; and afterwards, in 1819, he attended the classes at the university of Edinburgh, where he fully realised the expectations of those who educated him, and in the spring of 1822 obtained the prize given by the magistrates of Edinburgh for the study of the higher mathematics. It was here he first met Robert Stephenson, and that friendship began which afterwards became so remarkable a feature in their lives. He quitted Edinburgh in 1824, when, through the instrumentality of his constant friend and adviser, Sir Henry Jardine, he obtained an appointment on the Ordnance Survey. Mr. Bidder never forgot what he owed to his University education and the friends who put it within his reach. In 1846, when his professional position was established, being desirous to connect a tribute of gratitude to his Alma Mater with the name of his venerable friend and benefactor, he founded a bursary, or scholarship, of £40 per annum, for the aid of poor students, to be called the Jardine Bursary. With unaffected simplicity he states in the Deed of Foundation that, feeling deeply indebted to the University, and being sensibly alive to the pecuniary difficulties with which young men of merit have often to contend in obtaining a university education, he earnestly wished to aid in removing such difficulties, in remembrance of his respected friend, Sir Henry Jardine, to whose munificence and kindness he owed the advantages which he had enjoyed. It is pleasant to know that Sir Henry lived to receive this mark of affectionate gratitude. Mr. Bidder was, at the request of Major Colby, R.E., engaged on the Ordnance Survey, first as a pupil under Mr. R. Dawson, and subsequently as an Assistant Surveyor, at the modest remuneration of three shillings per day; later on he was removed to the Tower, to assist in the computations of the trigonometrical part of the Survey. Under the advice of far-seeing friends he left the Ordnance Department in April 1825, and entered the office of Henry Robinson Palmer, one of the founders and a Vice-President of this Institution, by whom he was employed upon the eastern (or Shadwell) entrance of the London Docks, as well as upon several railway and canal surveys. This term of service may be said to have constituted Mr. Bidder’s pupillage, though it does not appear that he was articled in the ordinary way. Sensible of the benefits he had derived from the education so liberally bestowed upon him, he was most anxious that, as far as possible, his two younger brothers should enjoy the same advantages; and his first care was to provide for this out of his small salary, by the most rigid economy and self-denial. In order to supplement his slender resources he undertook, in January 1827, the duties of a clerk at the Royal Exchange Life Assurance Office, in addition to his employment with Mr. Palmer. But the drudgery was unsuited to him ; and he was wont to declare, in after life, that he was 'the ‘ worst clerk that ever entered the office.' Tradition also accuses him of having introduced notes of calculations that were passing through his mind into the policies he was writing. About the year 1829 he entered the office of Messrs. Walker and Burges, his first employment being in connection with the laying of the granite tramway in the Commercial Road, at Limehouse. It may perhaps be deemed fanciful to associate Mr. Bidder’s success with any chance augury of good at the outset of his career, but it is none the less true that the endurance of this work seemed typical of his after achievements. One of his colleagues in Messrs. Walker and Burges’s office (J. B. Redman, M. Inst. C.E. ), states that in 1871, when the tramway was removed, the original stones were still in place, due in a great measure to the excellent way in which the road was laid. Another notable work upon which Mr. Bidder was engaged as assistant engineer, while with Messrs. Walker and Burges, was (circa 1833-34) the Brunswick wharf at Blackwall, the first instance of the extended employment of cast-iron piles and plates. This work aroused much interest, and was described by his coadjutor, Mr. Borthwick, M. Inst. C.E., in the Transactions of the Inst. C.E.,vol, i., p. 195. But the turning point of Mr. Bidder’s professional career came in 1834, when he was invited by his old college friend, Mr. Robert Stephenson, to take an appointment on the London and Birmingham Railway, the works for which were in full swing, and absorbing most of the engineering talent of the day. The great drawing office at the Eyre Arms tavern, St. John’s Wood, which was the head-quarters of the railway company, has become classic in the history of modern engineering; for within its bare walls was located a staff of clever engineers, such as was probably never before, nor has been since, assembled at one time. There are few survivors of that talented band, but by these it is still well remembered how the routine of the office was enlivened by Mr. Bidder’s humour and high spirits. In 1835-36 Mr. Bidder became connected with George Stephenson in parliamentary work, and specially in the contest for the various competing lines between London and Brighton, and with the proposed line from Manchester through the Potteries to Rugby. In this capacity ample scope was afforded for his wonderful power of rapid calculation before parliamentary committees. That exciting period embraced the palmy days of engineering; and the universally admitted and pre-eminent skill of Mr. Bidder as a witness very shortly brought him engagements which for many years throughly occupied every hour of his time; indeed, scarcely any undertaking of magnitude reached Committee which he was not engaged upon, 'pro or con'. The names of Robert Stephenson, Isambard Brunel, and Joseph Locke have been linked together as forming an engineering triad, and, from the circumstance of their several deaths occurring within a short space, the connection will perhaps continue; but a more justifiable association would probably be that of Stephenson, Brunel, and Bidder, whose battles in the committee rooms will long be memorable. It has been generally admitted that Mr. Bidder's great talent as a witness was that of analysis; he saw at a glance the weak spot in his opponent's armour, and his judgment was almost infallible. In 1837 Mr. Bidder was associated with Mr. Robert Stephenson in the construction of the Blackwall railway, and in applying the rope system of traction by which it was for many years worked. The method of throwing off and disconnecting the carriages, and of working the passenger traffic, was due to Mr. Bidder. In the same year, on the joint recommendation of Mr. Bidder and Mr. Robert Stephenson, the then newly-devised electric telegraph was tried on a length of 16 miles of the London and Birmingham railway, and almost simultaneously on the Blackwall railway. In 1840, when the Yarmouth and Norwich railway bill was in Parliament, Mr. Bidder recommended that the (single) line should be worked by telegraph on a plan of Mr. (afterwards Sir William) Fothergill Cooke. This led to an intimate friendship between the two. Mr. Bidder, guided doubtless by the experience gained upon the railways in question, was one of the first to perceive the immense value of the electric telegraph for commercial and general purposes, and the great future that lay before it in this respect. So impressed was he with this, that he persuaded Lewis Ricardo, Mr. Stephenson, Mr. Cooke, and others, to join him in forming a Company-the afterwards well-known Electric Telegraph Company - to provide telegraphic communication for the public. Later on, Sir Charles Wheatstone’s scientific abilities were devoted to fostering the bantling, which speedily became a giant. Such was the small beginning of the present extended system of telegraphic communication, of which it is hardly too much to say that Mr. Bidder, although not himself m electrician, was the founder. When the Belgian railway system was being planned, King Leopold consulted Mr. George Stephenson and Mr. Bidder in respect to it, and the recommendations of the latter were largely followed in laying out the lines, which have a well-grounded reputation for economy and efficiency. Mr. Bidder was also consulted by Lord Palmerston with reference to slate quarries in the Festiniog district, not at that time in profitable working, and in which his lordship was largely interested. Mr. Bidder advised the removal of the 'tops,' and a general opening of the quarries, and found a contractor ready to undertake the execution of the works. The result was the development of the quarry into one of a very remunerative character, which laid the foundation of the success of the well-known Welsh Slab Company. Conspicuous among Mr. Bidder’s characteristics were the completeness and symmetry with which he planned a work, and the prescience with which he endeavoured to, provide for future operations. As an instance of this, the laying out of the lines now forming the Great Eastern Railway may be noticed. A glance at the map shows a well-planned system of communication, evidently designed as a whole, and singularly free from duplicate lines; and it is to be noted, that, in spite of financial troubles, and of mismanagement which gave it an evil repute, that company has been able to secure and to maintain an uninvaded territory. In looking for a suitable coast terminus for the lines of railway in the Eastern Counties, Mr. Bidder selected Lowestoft, where harbour works were completed about the year 1847, which afforded evidence of what could be effected by skill and capital combined. Mr. Bidder, in conjunction with Mr. Robert Stephenson, constructed the first railway in Norway, that between Christiania and Eidsvold, about 40 miles in length. It was an inexpensive line, of the type now known as light standard-gauge railways, and was the pioneer of many other lines on the same principle. He was also the engineer-in-chief of the Royal Danish Railway, which was opened in 1855, and was instrumental in introducing gas lighting into Denmark, through the medium of an English company, in which he held a considerable stake. But Mr. Bidder’s magnum opus was undoubtedly the construction of the Victoria (London) Docks. Not only the merit of the work, but the idea of providing dock accommodation on a large scale for the trade of London in the Essex marshes was his own. To many the promotion of the scheme appeared to be an act of folly, destined to result in failure; but the result has proved that it was a remarkable instance of his far-seeing wisdom and sound judgment. By the judicious selection of the site, and the adoption of several economical modes of carrying on the works, a dock of the exceptionally large area of nearly 100 acres of deep water, with extensive quay space and warehouse accommodation, with larger lock and lock gates than any then in existence in London, and furnished with hydraulic machinery, cranes, &C., was provided for less than £870,000. To those who are acquainted with the cost of the earlier docks - of comparatively limited extent - on the Thames, this will appear a notable achievement, especially when the increase in the value of land at the time (1853) is considered. Cast-iron piles and concrete were freely used in the construction of the walls, and resulted, not only in economy of material, but in rendering the employment of a costly cofferdam unnecessary. The 80-feet lock gates were of iron, the outer curve forming the arc of a circle-another bold and successful innovation. These works formed the subject of a Paper, presented to the Institution in 1859 by W. J. Kingsbury, M. Inst.C.E., and constituted a new departure in the design of similar structures. Owing to Mr. Bidder’s foresight a large additional tract of land was included in the original purchase, with a view to ultimate dock extension; and after the lapse of more than twenty years he had the satisfaction of knowing that his advice was fully justified, by the actual carrying out of his original conception, and upon land the market value of which had probably quadrupled in the interval. The question of the metropolitan drainage and the purification of the river Thames had indirectly, through his intimacy with Mr. Robert Stephenson, occupied his attention at an early stage. Finally, in April 1858, in conjunction with Mr. Hawksley and Sir Joseph (then Mr.) Bazalgette, a report was presented to the Metropolitan Board of Works upon the Main Drainage of the Metropolis, which had the effect of settling the course of legislation on the subject, and practically determined the scheme as since carried out. 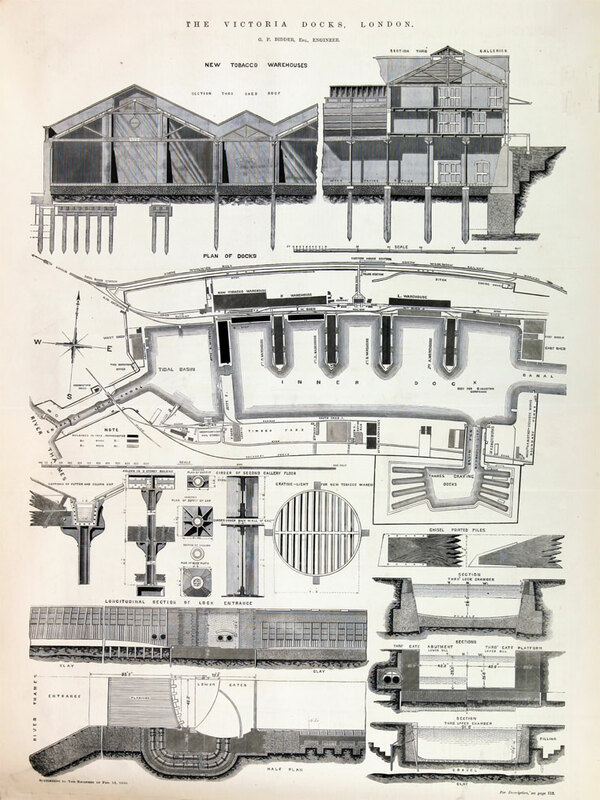 A year later, the Metropolitan Board submitted to Messrs. Stephenson, Field, Penn, Hawksley, Bidder, and Bazalgette the numerous competing designs for pumping engines and pumps to be employed by the Board; and those subsequently adopted were based upon the recommendations contained in a report made by the engineers named. Mr. Bidder was also constantly consulted by the Metropolitan Board, sometimes in association with other engineers, but frequently alone. Mr. Bidder was largely interested in the Indian railway system, chiefly in connection with the Scinde Railway Company, of which he was appointed consulting engineer in 1862, and of its allies the Indus Steam Flotilla, and the Punjaub Railway Company, which may be considered as one undertaking. This great enterprise was started in 1855, and owed its inception to the enthusiastic advocacy of Mr. W. P. Andrew, the well-known chairman of the now united company, who desired to make Kurrachee the great emporium of the trade of Northern and Western India. It was originally intended as a line of communication - partly rail and partly steam navigation - from Kurrachee to Lahore and Umritsur; but the scheme was subsequently developed so as to take in the Delhi railway, the whole forming what Mr. Andrew designated a 'steam arch.' The break in the chain by the navigation of the Indus for 570 miles was always considered by Mr. Bidder as but a temporary expedient, and he boldly supported the construction of a railway, to avoid the difficulties and delays inherent in any system of trans-shipment, at a time when the authorities shrank from the task. He probably knew that his counsels would prevail at last, but was possibly not prepared for the particular shape the fulfilment of the enterprise threatened to take. In 1869 it was announced that the Government of India had resolved upon taking the completion of the railway system into its own hands, and that future extensions would be made upon the metre gauge. This at once secured Mr. Bidder’s determined and almost vehement opposition, as it involved the interposition of a break of gauge in the midst of an important line, as well as the construction of the Indus Valley railway on a gauge narrower than that of the extremities of the lines it was meant to complete. Thus would have been established, as the result of considerable outlay, a double break of gauge, which would scarcely have been less inconvenient than the trans-shipment, from railway truck to steamer. Then ensued another battle of the gauges, and there was a time when the issue of the contest was doubtful, for the advocates of the metre gauge had adopted the cry of economy. But the consensus of engineering opinion against the proposal, headed by Mr. Bidder, whose report was first in point of time, was too strong to be overborne; and again he had the gratification of bearing a leading part in a great victory. At present, the Indus Valley (State) railway, on the 5 feet 6 inch gauge, is rapidly approaching completion, thus uniting Delhi to Kurrachee in one line of unbroken railway communication nearly 1,200 miles in length. In addition to the works mentioned, Mr. Bidder was engaged on numerous railway and other undertakings, the recapitulation of which would be tedious. But actual construction only formed part of Mr. Bidder’s practice; and his name will probably be as well or better known to the future student of engineering, by the prominent part he took in the great controversies that agitated the engineering world at the time when the principles which have since governed railway construction and working in this country were being finally settled. Among the many hard blows dealt in the 'battle of the gauges' Mr. Bidder’s sledge-hammer was responsible for not the lightest; and his evidence before the Royal Commissioners was exceedingly effective, and difficult to combat. He had a considerable share in the atmospheric railway controversy. Here also he was associated with Robert Stephenson against Brunel, Cubitt, and Samuda, and again had the good fortune to be on the winning side, in a contest scarcely less determined than the battle of the gauges. A remarkable instance of Mr. Bidder’s wonderful readiness, and solver of mental numeration, occurred in connection with the passing of the Act for the North Staffordshire railway. There were several competing lines, and the object of Mr. Bidder’s party was to get rid of as many of them as possible on Standing Orders. They had challenged the accuracy of the levels of one of the rival lines; but upon examination before the Committee on Standing Orders, their antagonists’ witnesses were as positive as those for the North Staffordshire, and apparently were likely to command greater credence. Fortunately Mr. Bidder was present, and, when the surveyors of the opposing line were called to prove the levels at various points, he asked to see their field books, which he looked at, apparently, in the most cursory manner, and quietly put down without making a note or a single observation, as though he had not seen anything worthy of notice. When the surveyors had completed their proofs, Mr. Bidder, who had carried on in his own mind a calculation of the heights noted in all the books, not merely of the salient points upon which the witnesses had been examined, but also of the intermediate rises and falls noted in the several books, suddenly exclaimed that he would demonstrate to the Committee that the section was wrong. He then went rapidly through a calculation which took all by surprise, and clearly proved that, if the levels were as represented at one point, they could not possibly be as they were represented at another and distant point. The result was that the errors in the levels were reported, and the Bill was not allowed to proceed. That no appreciable diminution in Mr. Bidder’s power of retaining statistics in his memory, and of rapidly dealing with figures both small and great, was perceptible in his later years, may be illustrated by the remarkable evidence he gave, in 1864, as a director of the Great Eastern Railway Company, on the Great Northern (Coal Line) Junction Bill. He then dealt with a multitude of distances, mileage rates, and other figures connected with various railways, besides the one in question. Again, several years later, when, having been requested by the Provost and Town Council of Inverness to report on the Ness floods, after he had visited Scotland during the summer for the purpose, he came to London from Devonshire at the end of 1872, and dictated a large portion of his Report, dealing with the results of calculations involving very large figures, which he had registered in his mind, but without any record on paper, and which he rapidly checked mentally as he proceeded. From civil engineering to the military branch of the art, as applied to national defence, is a scarcely perceptible gradation in fact, though the Institution of Civil Engineers was dedicated to the proposition that the two are separate and distinct. It was this circumstance that probably induced Mr. Bidder to preface a speech on the national defences by some remarks of an apologetic character, on the occasion of a memorable debate, which occupied five evenings at the Institution. Since then (1861) the connection between the two arts has tended to become closer and closer, and the latter years of Mr. Bidder’s life were largely devoted to the consideration of the best means of insuring this country against invasion. In this he was consulted by the Government, who also sought his advice on the subject of ships of war; and as a member of the Royal Commissions on the Loss of the 'Captain,' and on the Construction of Ships, he rendered good service, as well as on the War Office Committee on Gun Cotton and other Explosives. When 'The Engineer and Railway Volunteer Staff Corps' was created, in 1865, he became the Lieut.-Colonel Commandant, and he took an active part in solving the problems submitted to that body by the War Office. Mr. Bidder retained to the last his early predilection for a seafaring life, and was seldom happier than when cruising in his schooner yacht, the ‘Mayfly.’ This love of the sea caused him to enter warmly into all nautical questions - notably into the ingenious experiments of his friend the late W. Froude. In addition to his connection with various railway companies, Mr. Bidder was chairman or director of several industrial and commercial associations, chief among which were the Netherlands Land Company and the Rock Assurance Company, of which latter corporation he was a member of the board for more than thirty years, his attendance at the weekly meetings being most regular until within a short time of his death. Next to railway matters, hydraulic engineering seems to have had the greatest attraction for him; perhaps from the facility with which his mathematical powers enabled him to investigate the abstruse problems presented in the consideration of the laws governing the movement of fluids. Drainage, both agricultural and municipal, the electric telegraph, submarine telegraphy, the caloric engine, foundations, the combustion of fuel, the relative value of free and convict labour, dock gates, naval construction, piers, the cost and efficiency of various kinds of motive power, rivers and estuaries, the calculation of roofs, steam navigation, the preservation of timber, the removal of wrecks, are some of the subjects outside his own chosen domain in which he drew on his great stores of knowledge for the benefit of his fellow members. The last occasion on which he spoke at a meeting of the Institution was on the 11th of February, 1873, when he delivered a long, closely-reasoned, and telling speech, against the proposal to introduce break of gauge into India, as previously referred to. This address may be regarded as a farewell worthy of his last appearance among his associates of nearly half a century. The processes by which Mr. Bidder performed his calculations have been described by himself, in the Lecture on Mental Arithmetic which he delivered at the Institution of Civil Engineers in 1856. He always expressed the belief that his power of mental calculation was due, not so much to any special faculty, as to the system which, by accident, he had adopted in teaching himself, that, namely, of dealing with the actual numbers represented by concrete things, instead of learning their relations through the medium of arithmetical symbols; and he maintained that most children, if similarly taught, could achieve similar results. To a limited extent this is perhaps true. It cannot be doubted that this system referred to will, unquestionably, give a better grasp of arithmetical principles and the relations of numbers than the mere teaching by figures. But, after every allowance has been made for the superiority of the system, it must be acknowledged that the mastery of figures possessed by him, and the extraordinary rapidity and accuracy with which his answers were given, required mental powers of a very rare order, and especially a most retentive memory, and a strong power of realising mentally the numbers he dealt with. Even so far as his power was to be attributed to his system, it is not the least remarkable circumstance, and in itself strongly indicates a special faculty, that a child of the age of seven years should, without any teaching, have invented and adopted a system so excellent, and have discovered for himself the rules and principles on which the solution of various problems depended, such as the extraction of square and cube roots and the calculation of compound interest. It is hardly necessary to remind members of the profession of one example of his power of adapting to practical purposes his gift for figures, namely, the well-known 'Earthwork Tables' published by him early in life, and which have been translated into several foreign languages - tables that have saved many hours of weary labour in engineers’ offices. In concluding the above lecture Mr. Bidder accused himself of hastiness of temper. It is probable that the peculiar circumstances of his youth, which enforced the habit of early independence of thought and of self-reliance, rendered him apt to be impatient of the foibles of others, and the very frankness and single-minded of his character made it impossible for him to disguise his opinions, however much it might have been his interest to do so. It is also not improbable that this irritability was in a measure nervous, and was due to the intense mental strain induced by a brain which never had any repose. But the roughness was more apparent than real. Trouble met with ready sympathy and help from him; and there are many, both in his own profession and out of it, who can bear witness to the disinterested zeal and kindness with which he threw himself into the affairs of others, and who know that in him they have lost a faithful counsellor and a true and steadfast friend. Few could enjoy his intimacy without learning to value his geniality, as well as his largeness and warmth of heart. And yet they who never saw Mr. Bidder in his home knew but half his worth, nor could rightly appreciate the perfect unselfishness and gentleness of a man whose greatest delight lay in the happiness of those he loved. His was a singularly bright and sunny disposition; and though averse from all ostentation and ceremony, he liked to gather his friends round him in a free and informal manner to ramble with them round his farm at Mitcham, inspecting the stock and crops; equally ready to listen to a child's prattle, or to discuss curious problems and scientific discoveries, and sure to enliven the conversation with some of the quaint tales and original illustrations with which his memory overflowed. All children loved him, and seemed instinctively to recognise a kindred and companion spirit in one to whom, even in old age, their voices could bring back the gladness of youth. His kindly feeling extended to animals, whom he could never bear to see ill-used or neglected, taking no little pride in the confidence and affection of his four-footed and his feathered friends, whose habits and intelligence were an unfailing source of amusement to him. In 1860 he purchased a house at Dartmouth, and from that time spent part of every year in Devonshire; and when obliged, in the summer of 1877, to give up all professional engagements, he retired thither to spend the remainder of his life in the native air which he felt was his best medicine. In his keen appreciation and enjoyment of the marvels of nature, and the intelligent examination of the problems they present, Mr. Bidder did not neglect the serious consideration of a still greater mystery. To use his own words, 'There is a point where human knowledge ceases to be possible; but to assert therefore that nothing exists beyond, is to assert a knowledge of what we cannot know.' He was not the man to accept blindly the teaching of any church or sect, nor was it possible for him to take a narrow view of religion; but he thought much and gravely on the subject, searching with humble and earnest care the revelations of Scripture and science, and recognising in the wonderful operations of Nature the hand of a merciful God, and finding a sure hope for all men in the gospel of their Saviour. For the last twelve months of his life he lived as a neighbour to death, knowing, even better than those around him, that for him there was but little time to come, yet accepting the restrictions imposed by failing health with such cheerful serenity, welcoming the friends whose kindness helped to relieve the monotony of an invalid's life with so much genial pleasure, and so ready to be interested in every topic of the day, that it was impossible for those who loved him to realise that the approaching change was so near. He subsequently performed some other calculations with equal rapidity, showing how unabated was the mental power when physical life and strength were flickering within a few hours of extinction. 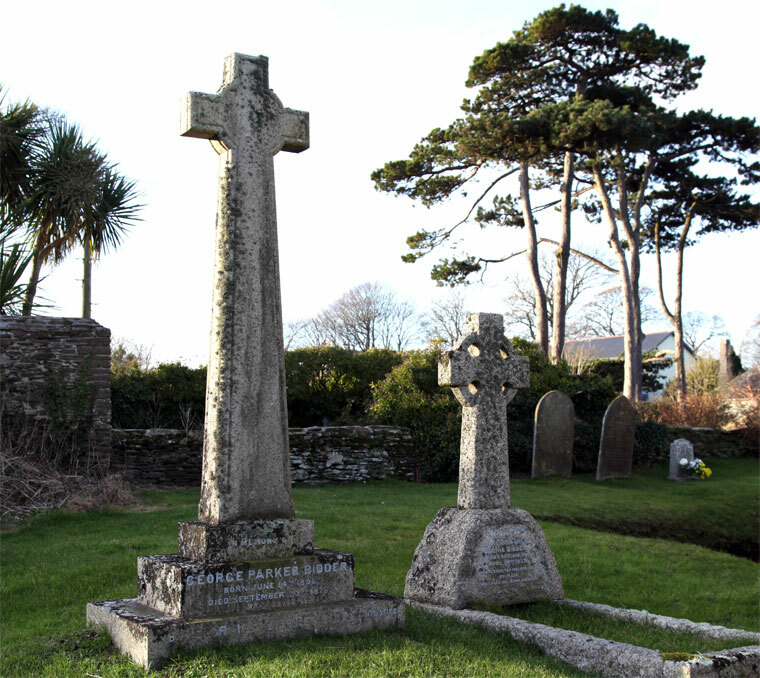 Two days afterwards, on the 28th of September, 1878, he died at Dartmouth, rather suddenly, and was buried in the churchyard at Stoke Fleming, an adjacent village. In all save himself his wonderful vitality and energy raised vain hopes, and only when without one pang the spirit parted from its worn-out, frame, was it apparent how frail the link that united them had become. ↑ The Engineer 1878/09/27, p228.